Palm Springs has been one of the hottest destinations for Californian locals for a quick getaway. But recently, thanks to Coachella and several Instagrammable hot spots, Palm Springs has been the ideal destination for everyone from all over the world. When my BFF and I were planning our annual trip together, I instantly offered Palm Springs. Not only is it a great spot for a girl's getaway, she's from Portland where it's been rainy. So I knew she would enjoy the thought of poolside drinks and plenty of sun! My Eat, Play & Stay guide through Palm Springs is sure to help you and your girlfriends have a blast! The Ultimate Girl's Getaway in Palm Springs Guide, here we go! Tipper's - This new deli style restaurant just opened July 2016 and still in a soft-opening. Their charming logo and decor aren't the only pleasing things at Tipper's! We grabbed their popular Italian Sausage Breakfast Bowl before starting the day and yum, so hearty and delicious! They had a great assortment of salad, sandwiches, beer, wine and in the near future, cheese and charcuterie! We also had the pleasure of meeting the owners, Michael & Felix. I can hardly wait to visit again once they're fully running! Norma's @ The Parker - While the Parker hotel is famous for their quirky decor and Instagrammable entrance, hidden inside is Norma's Restaurant. I've heard and read so many reviews that my BFF had no choice but to tag along. 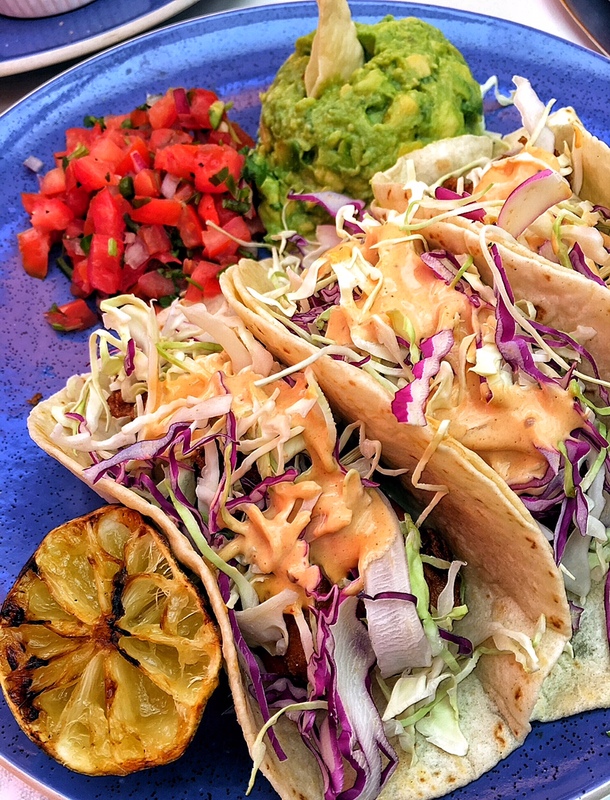 Their popular Fish Tacos and award winning Potato Pancakes got four thumbs up! Johannes - One word. Wow. Forget the best of Palm Springs, more like best of California! I'm quite the foodie and try to eat at new restaurants frequently in the Los Angeles area. My BFF would agree that Johannes ranks very highly on my overall list of favorite restaurants. The Austrian chef specializes in schnitzels and oh my, it's out of this world. My favorites: the Endive Salad, Peppercorn Schnitzel and Pork Chop. I'm drooling just thinking about it. Their vast selection of wine and fun cocktails made for the perfect dinner with my BFF. The Great Shakes - Got a sweet tooth? The Great Shake is a Palm Springs staple! Their wall full of creative milkshake flavors make it hard to choose just one! Their token donut-on-the-straw is so scrumptious I got a box of them to go! Azure Spa & Salon @ The Riviera Palm Springs - I have to be honest, this was probably both the BFF and my favorite part of the trip! The Azure Spa & Salon inside the darling Riviera Palm Springs is the ultimate spot for girlfriends. It's over 11,000 sq ft of total zen. We both received the 50 minute Desert Sage Combo Treatment, a deep sugar scrub and an essential oil massage. The terms fabulous and relaxing seems like an understatement for how we felt afterward. The Spa even has a hair salon, which normal spas don't tend to have. Fun fact: the property used to be the amphitheater and stars like Frank Sinatra performed there! The Spa Director's office? It was a former dressing room! How cool is that? Aerial Tramway - One must-do activity in Palm Springs is the Aerial Tramway. It's home to the world's largest rotating tramcar that takes you up 10 minutes of breathtaking views, from 2,000 ft to 8,516 ft! You can either eat at one of the two restaurants at the peak, simply enjoy the scenery or go on a full blown hike through over 50 miles of trails. VillageFest - The VillageFest is every Thursday from 6-10PM in downtown Palm Springs. Over 200 booths of food, art, entertainment and other hand-crafted items fill the streets for a fun night of browsing. It's free and a great way to walk off the calories from dinner! Mid-Century Architecture Drive - This activity is something I made up earlier this year when I was in Palm Springs. Drive through the residential area and get lost amongst the classic, Californian, mid-century architectural Palm Springs homes. Pictured above is the Instagram-famous "That Pink Door" and our ride for the week, the newest Toyota Prius. This roomy, quiet, chic and comfortable drive went 550+ miles without 1 gas stop! Insert shocked face emoji here :) It was the perfect ride to explore Palm Springs and the neighborhood to admire the unique homes. DoubleTree by Hilton Hotel Golf Resort Palm Springs - The newly renovated property is chic and beautiful. I can always count on a Hilton property to deliver great customer service and who can deny the delicious DoubleTree Cookie? If you're a golfer, their award winning 27 hole golf course is right in their backyard. My favorite? The saltwater pool overlooking the golf course! We spent hours by the pool every single day! 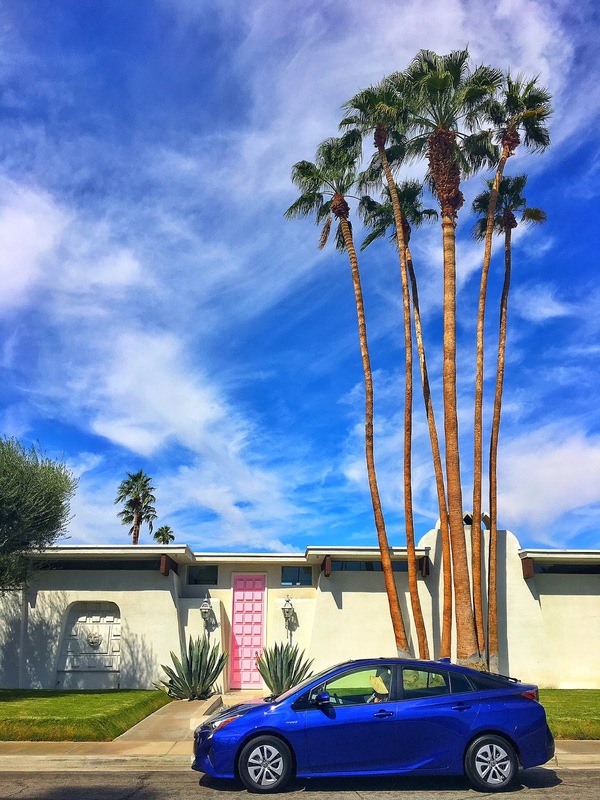 A huge thank you to Toyota for the beautiful Prius, Visit Palm Springs for hosting the getaway and all the patrons on the fun-filled itinerary! All opinions are as always, my own. Thank you! Thank you! Thank you! This post is perfect for what I needed for my next girls trip! What's better than eating all day, hanging out by the pool, and having a spa day with your BFFs?? Great photos as well! Ah, I'm drooling over those potato pancakes! I remember seeing that photo from the Aerial Tramway on your Instagram a while back and wishing I could go do that immediately! It looks like so much fun. Now I have it bookmarked! I had not really considered Palm Springs for a getaway since I'm not a golfer. So glad to know there are other things to do, especially hiking. I would need to do some hiking to burn off some of the calories from the yummy looking food! What an awesome place to visit! 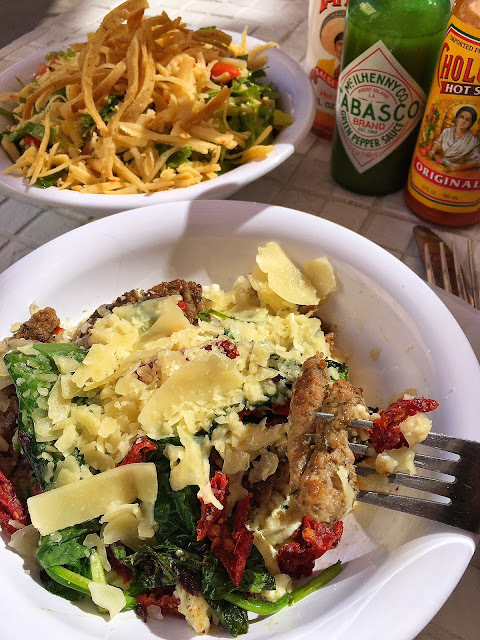 The food from Tippers looks amazing and totally my style of dining! What a fun girlfriends getaway, would love to do this with my sisters! Palm Springs looks like such a fun place for a quick getaway! I've seen way too many cool photos of it so now I know I have to go some day. Wow!! This is beautiful and that food looks lush. As an American expat living in Ireland, the diversity of food in the states (maybe it's just my strong desire to have a taco) is amazing. Glad I found this via #flyawayfriday! I'm dying to go to Palm Springs now! And also now I'm hungry - haha! The only time I got to see it was as a kid because my Grandma retired there. Now I'm a 20-something ready to plan a trip with old college buds :) Thanks for the info! Def saving this one! Loving all the photos! Especially the food ones! Can I have one of these shakes NOW?! HA! Loving that you included a spa! What girl doesn't like getting pampered! There is a massive spa and sauna culture in Estonia, where I am from and I miss it so much! It's also dirt-cheap, because it's so big! Thanks for sharing your guide! And I hope you are having fun in Maui! I love Palm Springs! And had no idea about the tramway, I'll definitely have to check it out the next time I'm out there! This looks like an incredible getaway. The food made me incredibly hungry! The milkshake with the donut on the straw is very unique and perfect for people with sweet teeth like my husband! So cute! Gotta love Palm Springs! So close and easy to LA! !